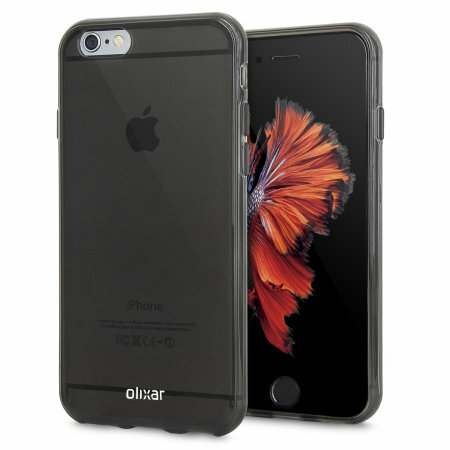 Custom moulded for the iPhone 6S, this smoke black FlexiShield gel case by Olixar provides excellent protection against damage as well as a slimline fit for added convenience. It's not black - it's a muddy brown colour. Very disappointed with the colour; everything else is excellent. As described product, can't comment on durability as yet, promptly delivered, shame delivery is extra as made this an expensive purchase. Great item. Looked in shops first and prices were silly so looked on mobile fun, prices totally different ordered and arrived within a couple of days.item was as described and fitted like a glove Great quality product too. Will be using this company and products again. A phone cover very well made, all the cut outs with nice bevelled edges. Does not add much more to the phone size and feels comfortable to hold. Amazing price, go for it! A good item and easy to install. Just ordered my new iPhone and needed a good case without paying over the top for it. Came across this one and was very happy with my purchase. Ordered it in the afternoon and was delivered the next morning as they said it would. Why buy from more expensive sites when mobile fun offer great products at great prices too. Will use again to buy future products. It is really nice cover. Exact fix for my new Iphone 6. Very happy with the product. Good product for very good price. Good value for money. Quality seems decent. Catches finger prints but I'm not bothered as it's not very obvious, thanks to the dark grey finish which is not very glossy. Fits perfectly and looks part of the handset. Not had a chance to test its effectiveness in a drop test but it looks good. i love this phone case. not bulky but easy to grip to give you confidence of not dropping your phone. doesnt disturb the look of the phone. this is the 3rd time i have purchased this product as a present for people who have admired my case. it covers the sides & back of phone only so i use a screen protector too. Fits perfectly gives the phone some protection without adding any bulk or weight. Good Quality case - but not great for charging! Case looks good and seems to be robust, however not all charging cables work with it - for example the standard apple lightening cable doesn't work with the case - so I've been having to remove the phone from the case to charge it. Really good value for money, delivered on time, good quality, protects phone really well, great buy! Item is as described, fits perfectly all holes line up on my iPhone 6. Glass protector is of better quality than others I have tried. Very happy with the appearance and fit of this case and it adds very little weight or bulk to the phone. Hard to know how well it will protect the phone if I drop it - just need to try and not drop it! This item was exactly as described & it was delivered very quickly. Exceptionally pleased with it. Brought for my daughter's new phone. Came before the due date which was useful as it was part f her birthday present. Please with it. It fits well and is nice looking. She is happy with it. Have brought quite a few items and have never had a problem with them if you read the details on items before you purchase them, then unless it is broken then there should be no complaints about any items. This is ok. Does the job intended. Good texture that alliws you to grip phone. However this is not hot pink as per the picture - it's a much paler baby pink. Very impressed with iPhone 6 case. It fitted snuggley over my iphone knowing I have some degree of protection in the event it should be dropped or misplaced and has very smart appearance without detracting from the style of the phone. Got a new phone, needed a cheap case to protect until payday - ended up being better than expected. Easy to get on and off the phone if needed. Easy to clean. All round good product. I needed something quickly to protect my brand new iPhone6 and thought this appeared to be the best value for money. It arrived the day after ordering and is exactly what I was looking for. Being non-slippery it means I can lay it on my facia in the car and not worry about it moving. Flexishield iPhone6 Case - smoke black. This cover protects without adding bulk and you can easily access the buttons when it is on. I like the turquoise colour as well. I can't say whether it is especially brilliant if you drop it since I don't tend to drop my phone (jinxed myself now). However, you can see that it would probably bounce rather than smash if it did drop. There is no protection for the screen, but again if you're not keeping it in a bag with your car keys scratching it up, it should be fine. Best thing is that you can see all the beauty and slickness of the apple design without a great big cover on it. The item is well described and pictured on the website, it enables a form of grip while holding the phone in your hand and the case is fairly thin. I bought a few more cases but this one is going to be the one I stick to. Before purchasing the case I wasn't sure of the website as I hadn't heard of it before however, the delivery was quick and the prices are good too I would most definitely recommend to others! Overall really pleased ! The hard silicone / rubber cover is the best cover that gives much needed protection to the iPhone while not interfering with the 'styling'. If you want a pretty cover that is still strong and does not interfere with the ports or the buttons this is the cover you are looking for. Very nice product and fast service! Shipped pretty quickly for an overseas order, 8 working days to our rural address. The delivered product was exactly like we expected and made a lovely present. Thanks a lot! Bought this as a stocking filler and was great quality and sent very quickly! Thanks! Love this cover so thin and sleek fits perfectly :) adds a great touch to my iPhone. Covers the iPhone, without adding too much to the width of it. Easy to put on and all buttons are working perfectly. What attracted me to the case was the fact it was clear but with a tint of frost white giving it a stylish look with my rose gold iPhone. When it arrived I was surprised at how good quality it is. Given the price I was half expecting a tacky case but it's brilliant. Feels great in your hands and fits the phone perfectly. An absolute BONUS would be that I can use 'angled jack' earphones, my previous cases wouldn't allow for this so I'd have to take the case off while listening - which is a pain. So all in all. Very happy with this case and will be sticking with this brand in the future. I hate flip covers, and the other covers in stores were very expensive 30 EUR +. This cover is excellent value and does not take away from the iphone style with its transparent design. Great product that does what it says on the tin! Also, it's super slim and not at all bulky which was my one issue with getting a cover for the iPhone 6 but this one is great. Cheap product, looks amazing too. Adds very little bulk ones to the iPhone and I like the translucent look! I bought two other cases at a big box store that just weren't what I was looking for. I saw this case online for a great price and figured the price was worth a shot as it sounded like what I was looking for. I opened the package upon the fast overseas shipping and right away I knew it was what I was looking for. Great transparent smoke color that I was looking for, as well as rounded edges that sit just enough above the screen to keep the screen off the surface it's resting on. Highly recommended for any person wanting a smooth, sleak and not flashy, non-bulky cell phone case with enough coverage for full protection! I faffed around for ages looking for a cover for my phone but seriously this was just the best deal ever and exactly as described. Delivery was speedy thanks u am so happy with it! I bought this in advance of getting a iPhone 6S so that I'd have a cover when it got to me. I wasn't sure whether it would fit but I needn't have worried, it was good fit. Case fits perfect. Very happy with my purchase. Overall, the case is very good. It provdes a good grip for your device, and is very protective. The case is also very aesthetically pleasing, and gives a great look to your mobile phone. The only complaint I would have about the case is that it gets dirty very, very easily. After just a few days, I could already see the edges starting to look dirty and turn a slightly brownish colour. It doesn't add too much bulk to the phone and provides adequate protection. Excellent quality of case fits the mobile perfectly. Outstanding delivery options sent in post immediately arrived a day earlier even though ordered last in evening. Before I bought this case I was conscious of not getting a case which inhibited the excellent design of the iPhone 6. This case does this perfectly and provides great protection to all the areas that matter. It is still sleek and slim and keeps all the attributes of the iPhone 6 accessible and functional. Would highly recommend. A good fitting and discreet case that protects the handset well from drops or bumps. All function buttons fully functional, and camera and socket holes accessible. Excellent value for money, would definitely recommend. As always, fantastic experience with MonileFun. Easy purchase and fast delivery. This is exactly what I wanted--a plain no-frills cover which fits perfectly, provides good protection with a bit extra grip and is very good value. The covering over the buttons was unexpected but they work perfectly and only Jonny Ive worshippers would notice them! I have ordered this case on Friday and I got it on Saturday morning. Quick despatch and delivery. Case fits perfect on the phone and lays in hand safely. I love this phone cover! I have to admit that I was a little grumpy about the large size of the iPhone 6 and that led to a search for a small profile, lightweight cover. I tend to drop my phone once in a while, so I was also looking for something with just a bit of give to it to cushion the bounce. This cover does the trick! It is low profile, lightweight, has enough give to cushion the fall, is slick enough to slide into my pocket, but not slippery. Don't waste money on an expensive case for your phone. This case does the job perfectly and so reasonably priced. The case feels like it will definitely protect the phone if I drop it and it is a lush colour which still shows the apple logo through it. Highly recommend this product. I am really pleased with this product - not only cheap and quick delivery, the product itself provides a secure slimline cover to my phone, with ample space for things like chargers and provides the grip you need for such a smooth phone which is easy to drop. The only negative I can think of is the colour doesn't quite reflect that of the website, however even that is not an issue to me now. Very good service, fast delivery. Item is lighter in colour than shown in the picture, more of an opaque, baby pink. Quality product, not too chunky, fantastic value for money. Very pleased with my purchase! Good fit. Sturdy construction. Good price. Quick delivery. The only negative if I am being picky is that it is a paler pink than the illustration which looks fuchsia pink and I would have preferred. I got the package in very good condition and well packed. The cover quality is awesome, very nice griping and cuts are very clean.... 5 out 5 for this product. Cover suitable for adding a bit of colour to your iPhone. No protective qualities. Delivered within a week. Good price. I bought the iPhone 6 a few months ago and since then I changed a few cases that i bought on a popular auction site. With any one of them I have not been completely satisfied. Then I heard from a friend for a website mobilefun where I found 'Flexishield iPhone 6 Case' and ordered the same. After about a week I received a package. After few days of use I can say that I am very satisfied with the case. Grip is very good, the thickness is satisfactory, material quality seems excellent; but(!) I have a grudge on the buttons for power and sound. They are very hard and difficult to compress, I was hoping that the buttons will eventually become soften, but that did not happen. That's the only bad thing and that's why I gave this case 4 stars. This is a great case, but the colour is more green then blue. It fits perfectly and feels great in your hand, but the colour is the reason why I bought this case. Having had my new iPhone 6 for around a month I was experiencing some near misses when handling it especially when drafting and sending messages one handed. The phone is so smooth and not blocked shaped as the iPhone 5 and iPhone 4. More like a Galaxy S4. It feels as slippery as a bar of soap so can easily slip between your fingers. This gel case has made the iPhone 6 perfect! Easy to fit, easy to remove if you wish. Looks smart and no degradation in the iPhone's appearance. Feels secure in my hand even when working the phone one handed. Suggest it will also take an impact. I highly recommend this cover. I needed a protective case for my new iPhone 6. Had not found a case I liked at the shops so looked online and thought this looked good. It arrived within a couple of days and really like it. Very good close fit and it feels secure on the handset. The price is really good - compared to others I've seen out there on the market. Very happy to find such a top quality case - for the best phone handset I've ever had. Great value and quality product! Really pleased with the quality of these cases. Fab you can change colour without compromising anything else. My phone in this case has caught the eye of my Android husband. Recommend indeed!!!! The only reason I wanted a case for my iphone 6 was to stop the horrible wobble it has on flat surfaces and this case resolves that issue while adding protection and not adding too much bulk. The grip the case provides on the device is fantastic and greatly enhances my overall experience with the phone. Ordering from overseas I was pleasantly surprised how quickly my case arrived. Overall case is 9/10 and Service provided by Mobilefun 10/10. Was perfect couldnt fault it!! Looks pretty, easy to put on and off, not fancy but does the job (the pretty girly ones don't). Very flexible it is easy to use. The item is as described. I am impressed with the price of my product compared to what other sites were charging and the incredibly fast service coming from the UK. Great case, especially considering the very reasonable price tag in comparison to other cases and Apple branded cases. It is a very good fit (if ever so slightly loose on the sides of the case) but that is something most likely very difficult to overcome due to how thin to iPhone 6 is. Protects my phone very well, easily slips into my pocket (the Apple silicone case I had would constantly catch on my clothing and collect every single fibre of fluff in my pocket) and is still very grippy ensuring that the phone doesn't slip out of my hand (something that could easily happen if you didn't have a case of the iPhone 6). Prompt Shipping. Product exactly as described. I prefer my phone without a case usually but because I'm so clumsy with it I thought I'd better get one, this looks great with white iPhone 6, you can hardly tell it's even in a case plus it's saved my screen from breaking a few times! Having had a silicone case for my last iphone, I was curious to see how different this product would be. I was pleasantly surprised - the case is very tactile and fits snugly around the phone, while the small raised dots on either side mean you feel as though you have a proper grip on the device at all times. The volume/sleep buttons aren't affected by the case and work just as well, while the size of the phone once the case is on isn't that different, which is nice. The one thing I haven't tested is how much protection it offers if I were to drop the device - I'll leave that to the professionals! All in all, a great case and very reasonably priced. Highly recommended.